The Rhine is the perfect storage solution for your bathroom, kitchen or bedroom. 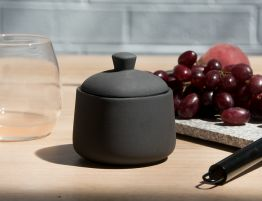 It's crafted from ceramic and has a beautifully natural charcoal finish with a glossy & smooth interior. Use yours to store jewelry and other little trinkets or as a sugar bowl!